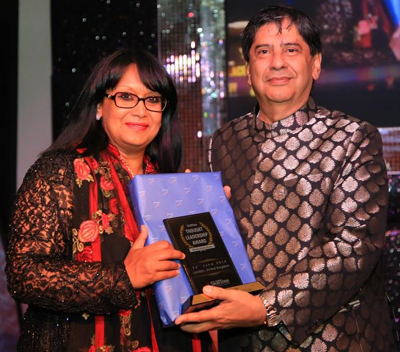 Mr Sarosh Zaiwalla, Founder and Senior Partner of the internationally renowned City law firm, Zaiwalla and Co Solicitors, was honoured with the Global Leader Award for International Law at the inaugural “SkillTree Great Place To Study – India Edition” awards ceremony at London’s world famous Madame Tussauds. Mr Zaiwalla was recognised for an outstanding legal career, which started with Mr Zaiwalla becoming the first Asian to set up a law firm in the City of London in 1982. Today, Mr Zaiwalla has been involved in over 1,000 high-profile international litigations and arbitration cases. Mr Zaiwalla has also acted for clients ranging from the President of India, the Government of the People’s Republic of China (PRC) and the Iranian Government to the Bachchan and Gandhi families in India. Mr Zaiwalla is regarded as a leading expert in arbitration and sanctions, and has led the senior team handling the case for Iran’s largest private bank, Bank Mellat, in its case against Her Majesty’s Treasury in the UK’s Supreme Court. The firm is representing the bank in its $4 billion USD damages claim, and has successfully had sanctions imposed on the bank by the UK government overturned. The “SkillTree Great Place To Study – India Edition” initiative has been spearheaded by SkillTree Knowledge Consortium, India’s first syndicate of private universities and institutions in the country, and was presented in association with the international brand consultancy Sterling Media and powered by Lavasa Corporation Limited, a subsidiary of HCC (Hindustan Construction Company). The awards presentation acknowledged the contribution of 20 of India’s leading educational institutions to promote India as a great place to study, as well as honouring six of the UK’s most enterprising, innovative and successful business leaders and public office dignitaries, who have all played their part in promoting relations between India and UK. The Rt Hon. the Baroness Prashar CBE, Deputy Chair of British Council, Indian film stars Upen Patel and Amy Jackson, former Transport Minister for London, Kulveer Ranger to name but a few. In commenting about his award win, Mr Zaiwalla said, “I am honoured and grateful to have been awarded with this very prestigious award. Over the years Mr Zaiwalla has been recognised for his work, and in1998, Mr Zaiwalla was made a Freeman of The City of London by the Lord Mayor of London. This followed in October 2002, where Mr Zaiwalla was given India’s Annual National Law Day Award by the Indian Prime Minister for his outstanding contribution to the field of International Arbitration Law. In June 2008, Mr Zaiwalla was appointed an Arbitrator to the Panel of Arbitrators by the Korean Commercial Arbitration Board. In 2011 he was appointed as Representative of the Union of Comoros to the International Maritime Organisation. Zaiwalla & Co Solicitors continues to thrive with a diverse client portfolio ranging from multinational companies, overseas governments, property magnates and ship owners. The firm has also acted for several high profile figures including The Dalai Lama as well as the Russian Federation and the Chinese Government. Tony Blair, former Prime Minister of the United Kingdom did work experience at Zaiwalla & Co in Maritime law.